On your next RV camping trip, you may decide to take the family fishing and spend a leisurely day out on the water. 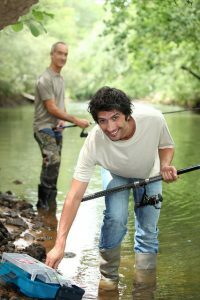 Rather than fishing just for sport, fishing while camping is the perfect opportunity to catch some food for dinner. Here’s a short guide on a how to gut a fish. Find a clean surface near a sink: Before gutting your fish, you will want to find a clean, flat work surface near a sink for gutting and washing. Have a bucket on hand, a pair of gloves (if you’d like), and a container for the cleaned fish. Oftentimes, marinas or fishing areas will have designated cleaning stations, which is worth knowing ahead of time. You will not want to gut your fish directly on your RV’s kitchen countertop, as it’s a messy process and you would have to worry about spreading germs. Avoid overhandling your fish and kill it humanely: To prevent spreading bacteria, do not overhandle your catch. You will also want to kill and clean your fish within a couple of hours of catching it. To kill your fish, do it humanely by clubbing it hard on the head or by swiftly cutting off the head with a sharp chopping knife. For a fish with scales, scale and wash the fish: To clean a fish with scales, hold the fish by the head and work from tail to gills with your knife or scaling tool to remove the scales. Wash the fish with running water and place it in a clean container in your cooler. For a fish with skin, remove the skin and wash the fish: Cut the fish along its back from its first dorsal fin to its back fin. Peel back the skin using pliers, pulling the skin toward the tail. Once you remove the skin, wash the fish with running water and place it in a clean container in your cooler. Store your cleaned fish in your cooler until you are ready to cook it. For RVs that are great to take camping, check out the selection at Hanner RV.